[Short note: blogging is more and more difficult with travels, consulting gigs and the need to spend some time offline, i will try to post some form of weeknotes with a visual and short text twist. It's not very fancy, only curious stuff I've stumbled across and collected last week. Of course I'll post more meat if I have time.] 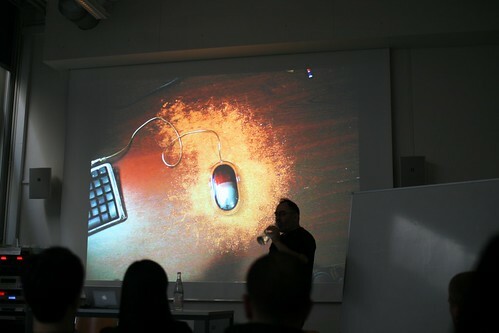 An intriguing speech by Golan Levin at HEAD-Geneva (Geneva University of Art and Design) about interactive art and speculative HCI. 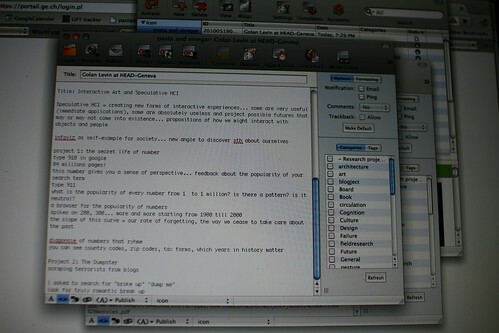 Levin described some of his projects and framed them as "creating new forms of interactive experiences... some are very useful (immediate applications), some are absolutely useless and project possible futures that may or may not come into existence... propositions of how we might interact with objects and people". I liked the idea of "infoviz as self-examination for society" and his thoughts about the computer mouse: "a mouse is pathological, as one of my teacher told me: to interact with a computer is to have a computer that has a model of you as one finger", "a urinal knows more about me than a computer mouse"
Some visual research about the gamepad project, like this beautiful representation of what was needed in 1958 to play "Tennis for Two" on an oscilloscope [via]. 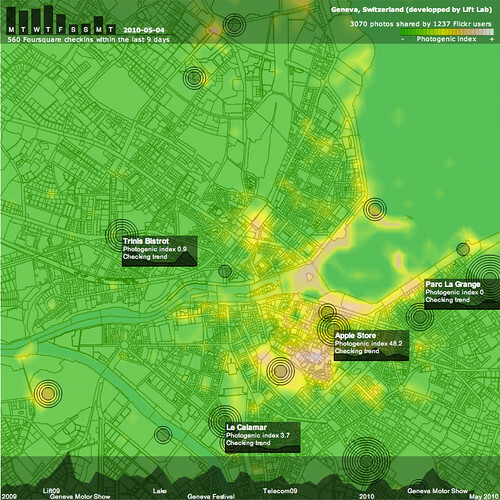 Preparing a speech about Science-Fiction and urban environments, I've been drawn to various representations of cities in the context of speculative movies. This picture of "Conquest of the Planet of the Apes" (1972) was of interest... as it shows how an existing US university (UC Irvine) was used as a scene for this movie. WiFi Camera is a curious project that " takes "pictures" of spaces illuminated by wifi in much the same way that a traditional camera takes pictures of spaces illuminated by visible light". 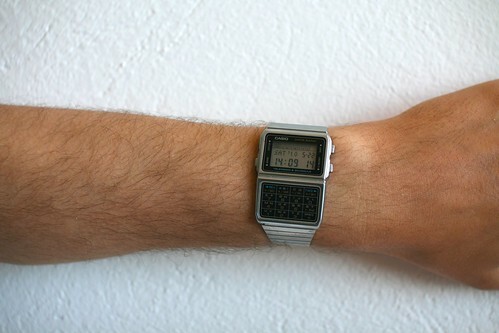 This 8-digit calculator watch by Casio triggered some inspiring discussion about object convergence, an interesting follow-up to my post about the pianococktail. It left me wondering about a watch connected to the Internets. For some reasons, I haven't seen groundbreaking project along these lines. It's not that I want to connect anything to the réseau des réseaux but I am curious about interconnected time machines. A trip to the funfair is always inspiring for informal observations of various forms of play. 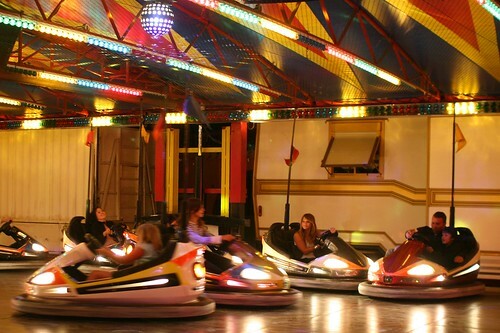 More specifically, bumper cars ("dodgems" in the UK, "auto-tamponneuses in France) were very interesting to observe driving behavior of people ready to bump into each other. What happens here? Why do people seem so happy doing this? Could it be an interesting metaphor for new car interfaces? 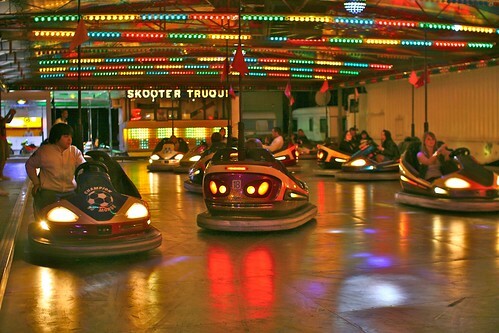 I don't have the answer but I definitely have a gut feeling that bumper cars are an interesting answer to some problems (which remains to be found). Next step is to dig the scientific literature about this funfair device.